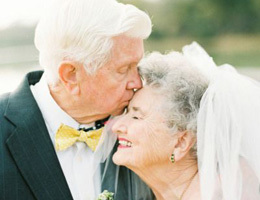 Senior dating sites claim to have a great track record of bringing senior people together. Yet, in reality, it doesn’t really matter if you are over 50 and dating or any age - as being in love is exactly the same for everyone, young or old! You truly enjoy being with the person you are with, and want to spend as much as time with them as possible. You miss them when they are not with you and, when you see them again, you get that funny little feeling in your stomach which only love can bring. In short, senior dating is just like any other type of dating; people meet (possibly through over 50 dating sites or through an introduction by friends), start dating and develop feelings for each other which, in turn, become what we call love! Yet, for seniors this is not the so-called puppy love syndrome. Most seniors have been through all of this before - and with almost all having been married at least once or at least been in a long term relationship. Accordingly, in general, senior daters possess a far better idea of what they want and what they don’t want from a person and a relationship. The majority of over 50 dating for the first time after being divorced or single again after splitting up with a long term partner like to take things fairly sedately - after all it may be 20 or 30 years since they last dated and they need time to adjust to being single and all that entails again. So if matters are getting serious between you and your senior mate, it’s prudent to take a step back and ask what the rush is. There is, for example, no biological clock ticking to hurry up and have (more) children and it’s worth to remember that anyone who gets engaged or married has the rest of their lives to spend together. A wise person will allow some time to make sure that this new relationship really is the one - after all senior daters can let the heart rule the head sometimes! It’s also smart to allow some time to build the foundation for your lifetime of love together, with around twelve months being a good amount of time to find what each other is really like and start communicating at a life partner level. Once you cohabit, it’s best to slowly make changes so that both parties both can adjust. With the benefit of their own experience, senior daters should always remember that building a new long term, midlife relationship romance is not a short term undertaking - after all, most over 50s daters want this new relationship to be their best!